If you’re a funny, creative or interesting writer with a unique perspective on some aspect of social media, we want you to appear on Clickfire. We offer a social media profile and link credit (nofollow). Do you have a particularly brilliant content idea? Here is exactly what you need to do to write and get your work published at Clickfire. Ask yourself whether you want to offer your best work. Keep in mind that we spend our own time and money promoting your content on the web so it needs to be the best. Offer content that you yourself would share if you happened to see it in your social feed. 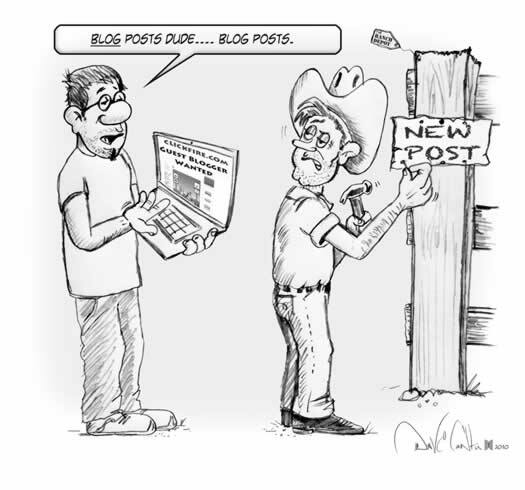 Many writers prefer only to publish their best content on their own blogs. Ask yourself if your content idea is particularly brilliant. Does it stand out far above all recycled noise published on blogs today? We strive never to publish good content, only extraordinary content. Be an author, not a link builder; an author is a person who enjoys writing. If you’re just looking to get a link, don’t bother. Leave comments on posts that you like as a way of introducing yourself and showing us that you generally have an interest. Share a post that you find particularly interesting on Clickfire. Subscribe, follow or link to Clickfire from a great destination – guaranteed to get our attention. Schmoozing the editors is not mandatory but has been demonstrated to work in some cases. 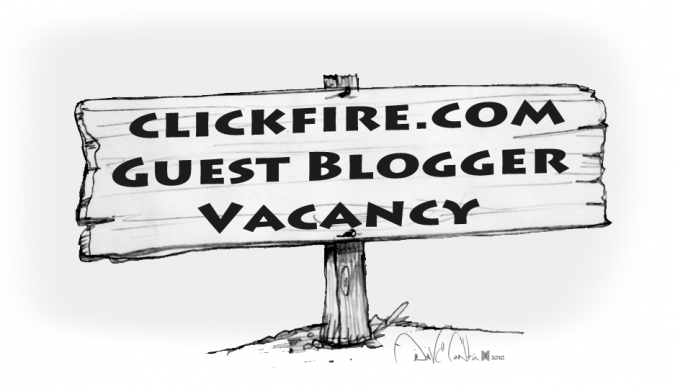 Want some examples of the types of guest posts we crave at Clickfire? Check them out here, here, here and here. If you feel satisfied about doing step 1, make a personal request. Write a personalized email – don’t use your template. Read the Guidelines to see if we are a match. Address the editor by name. We always know when it’s a template. Use your real first and last name. If you want to use a pseudonym… nah, just use your real name. Use your real email. Hiding behind a Gmail account may be construed as cowardly. Set up a gravatar image of your face (gravatar.com) for your email. Provide examples of your work – if your work has appeared on Mashable, CopyBlogger, Social Media Examiner, etc. we’re going to want you more! Say what site you want to credit in your bio or what company you are affiliated with. Include your killer title that scanners can’t resist clicking – very important (we prefer to get the title right before looking at content and images)! Write a quality post that is intriguing, bizarre or extraordinary in some way. We dislike seeing anything that’s been done before. Write a post that you’re proud to share and will share in social media. Create an unusual image, graph or chart that to complement your extraordinary post. Don’t use exact match keyword anchor text or multiple link spam within your post. Link to a related Clickfire post if the opportunity exists. Make sure that your extraordinary post is unique and won’t be published elsewhere. Use correct grammar – if you’re not a native English speaker that’s okay, just make sure it has been checked. Be eclectic – cite sources, use footnotes, etc. Log in and post to Draft. Fill out your Clickfire profile – create a unique bio including info about yourself and add links to your social media, sites, books, projects or whatever fascinates readers about you. The more the better. Format for the web – use h2 subheadings, short paragraphs, beautify and resize your images to fit (675 × 525), name images with correct syntax (example: name-of-file.jpg), use bold, italics, bullets artfully. Format for the web. Save your post as “Pending Review” when ready. Don’t publish it yet as we’ll want to schedule it for an opportune time when we can all begin getting the word out. Get a few friends to join you in retweeting, liking, plusing, etc your post on Clickfire (we’ll do the same). Respond thoughtfully to the users who have taken the time to comment on your post. Know that you’ve got a new friend – the door is open for you to write in the future. We promote our writers.